It is probably no surprise that I am continuing my Warlords of Draenor series today. 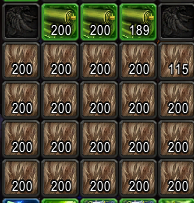 I am going through old expansions to find markets that are still profitable while we wait for Legion. Today we will turn our eyes to tailoring after already covering blacksmithing and inscription. 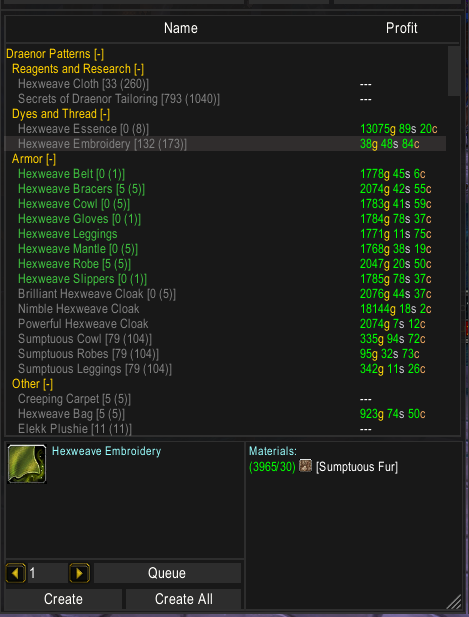 I haven’t actually delved into the WoD tailoring transmog market yet, as I have been using my tailor for hexweave bags. I expect that with the new bags coming in BfA the transmog use case for hexweave will look much better. The other advantage is that the profit margin is much higher so you can make a profit even if you rely on primal crafting. I don’t have any results to share, but we should expect it to be similar to inscription and blacksmithing with decent margins and fairly slow selling speeds. I covered the basics of Warlords of Draenor in my blacksmithing post and for those of you with no idea how this works I suggest heading over there. Like the two other professions you obtain recipes from the vendor in your garrison. You need to craft Secrets of draenor tailoring to purchase them and it will take a few weeks to get them all. I’ve already written about the Hexweave Bags and they can be a great source of profit if you just rely on the daily cooldown and work orders. If you use primal crafting however they will generally not be profitable. We can see that all the hexweave armor pieces show strong profits with the materials valued at the daily cooldown cost, so we want to get all of these recipes! My hexweave bags post tells you everything you need to know to setup a level 3 garrison with the tailoring hut for maximum output so head over there for the lowdown! As for the other Warlords of Draenor markets you will need to put in some work in TSM to get the correct crafting cost. Valuing your materials correctly is sadly not straightforward. I’ve refined my setup since my first post and I know have a custom price source that sets primal spirits at the lowest long term average of the various materials you can use to purchase them. This is the simple one. You get 20 Hexweave cloth from the daily cooldown at tailoring 700 or above. The daily cooldown base recipe yields 1 Hexweave cloth so to get the correct material price we just need to divide the crafting source by 20. To change the default material price formula head to the crafting pane of the TSM main window. Then you click materials and search for Hexweave Cloth. 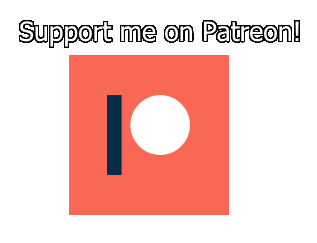 Click it in the list and the window above will pop out. The Primal crafting recipe for Hexweave cloth takes 10 Sumptuous fur and 1 primal spirit. The recipe yields two Hexweave cloth and it can be obtained from the fur trader in your garrison. As always you may have to wait quite a while to have it show up. This checks the dbhistorical price source for all the materials and returns the cheapest one. Depending on which materials you use this might not be the best approach. If you know you only use 2-3 of them using the average value for dbhistorical for those might be more appropriate. To value our Hexweave cloth using this minimum price the formula in the material price window should be as in the screenshot below. The value for one cloth is the price of 5 furs and half the price of one primal spirit. All the materials are traded 5 to 1 for Primal spirits so we multiply minwodmaterial by 2.5. The TSM setup is once again pretty much identical to the other WoD markets. 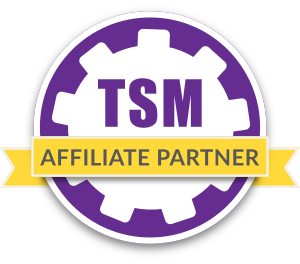 We use the same crafting and auctioning operations as they have been proven to work well for crafted gear. I have used that exact auctioning operation for more than 1.5 years without changing it.